When I came across this painting I nearly fell off my chair its impact was so powerful. This image and concept resonates so strongly with my own work where the horizon is a predominant feature. Also, in a previous post Curvature: Pastel, I have begun to separate out the elements of earth air and water into individual spaces. I am interested in the dividing line of the horizon and particularly when elements merge in certain conditions creating an eerie, mystical illusion where the eye has nothing to focus on other than the intensity of the atmosphere. 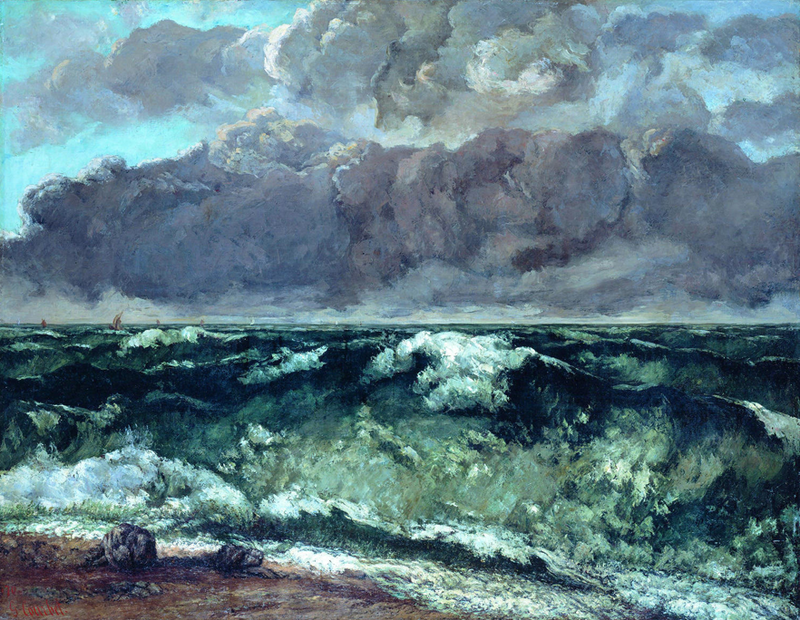 This entry was posted in Research, Research and Development and tagged Action Painting, art, Arts, Atmosphere, atmospheric, Clouds, Gustave Courbet, Horizon, Oil painting, Romanticism, Sky, the elements, The Wave, waves. Bookmark the permalink. Yes, what a fabulous drama! Wide horizons and the division of the view into sky/sea/land are very much in my mind too. Best wishes, Alice. Hi Alice, Thank you for looking at my blog and for getting in touch. I have had a look at your blog and it seems we have much in common, am very interested to find out more about what you are up to (is it ok to put a link to your blog on mine?). I have bookmarked and will follow your progress. What an amazing residency you have got, a dream come true to spend so much time in such a beautiful place. I would love to meet up with you sometime. I have got loads of questions to ask and it would help me tremendously with the next module of my M.A. Also, I am sure your practice would be of interest to some of my degree students. My email is amtickle@atickle.karoo.co.uk it would be great to hear from you.